Liberal Leader Christy Clark is running a campaign of distortion when she claims a New Democrat government would freeze several capital spending projects, NDP Leader Adrian Dix claims. 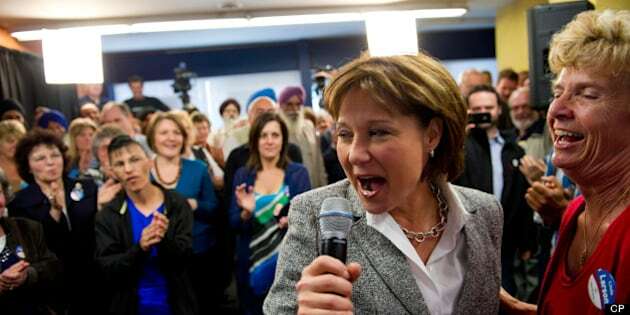 But Clark isn't backing down from an assertion that could shake the confidence of several B.C. communities over much-anticipated hospital and jail improvement projects. Clark told reporters in Kamloops on Thursday that projects such as the $600-million expansion at Royal Inland Hospital and a proposed $7.4-million new technology centre for students could be halted under the New Democrats. A day earlier, she warned the same would happen to a proposed hospital improvement project at Penticton Regional Hospital, and to the building of a new prison in Oliver because the NDP's spending promises are unsustainable. "What I would challenge Adrian to do is for once be clear about where he stands and tell us which projects he plans to freeze and which ones he plans to let go ahead," Clark said on Thursday. She is basing her concerns on the NDP's platform document, which says it "will not be making capital commitments beyond what is available in the current capital plan." The platform also says the NDP will continue with projects that are currently underway. The NDP platform states the current B.C. budget pledges $18.3 billion in capital spending on schools, hospitals, roads, bridges, hydroelectric projects and other infrastructure developments across the province. "We will focus capital investments on real needs and priorities," states the NDP platform. "An NDP government would not have sunk half a billion dollars into a new roof for BC Place. Instead, we will prudently invest in education, health, transportation and community infrastructure that is truly needed across the province." Dix, who was campaigning in Vancouver on Thursday, denied Clark's claims and fired back at her allegations by calling the Liberals' campaign one of distortion and disrespect. "We set out in our capital plan that we are accepting the frame of their capital plan ... and we're pursuing the projects they're pursuing," he said. "So the only way they can argue we're not going to do the Penticton hospital is if there's no money in the plan that they claim is there." In February 2012, Clark announced the B.C. government would build a new $200-million Okanagan prison on land owned by the Osoyoos Indian Band near Oliver. She said the 360-cell remand centre would be built in the Senkulmen Enterprise Park, an industrial park on Osoyoos Indian Band land, 28 kilometres south of Penticton and seven kilometres north of Oliver. The government said the project will create up to 500 direct and 500 indirect jobs and 240 full-time jobs at the prison. Also, last winter Clark announced the government will proceed to the planning stage for a new patient-care tower at the Penticton Regional Hospital. Doctors in Penticton have said the city's hospital is on the verge of major troubles because of overcrowding and outdated facilities. The Liberals committed $2 million for the development of the hospital business case, which is expected to be completed in 2014. Clark greeted door-crasher customers at the newly remodelled Canadian Tire store in Kamloops on Thursday. MLA Terry Lake, who represents the Liberals in the Kamloops-North Thompson, said the store expansion represents growth and confidence in the area. Dix's platform calls for the NDP to spend $2.03 billion over three years on grants for students, welfare increases and family bonus payments. Dix said the money to pay for the NDP promises will come primarily from tax increases on banks, corporations and high-income earners.